This timeline is NOT complete. Any omissions are unintentional as this timeline is a work in progress that will be added to over time. Please click on the contribute icon on this page if you would like to add an event. Pageview is still known as the ‘Malay Location’. The population is largely ‘coloured’, ‘cape coloured’ and Malay. 5 stands are transferred to Indians. The ‘Coolie Location’ is struck by bubonic plague. 20 March, The mixed population is evacuated and the area burned to the ground. July, Most of the evacuees start moving back into the urban centre, mostly into the ‘Malay Location’, one of the view areas for legal ‘non-white’ occupation. 48 stands are transferred to Indians. 5 September, Dr Yusuf Dadoo is born. 112 stands are transferred to Indians. By 1934 the racial character of Pageview had changed a great deal by becoming racially mixed as a result of the unavailability of other legal, urban, ‘non-white’ living areas. The Native Urban Areas Act is passed. 'Africans' are moved out of the south of Fietas (between 17th and 24th Streets) to Orlando and ‘Coloured’ people and Tamil people moved in. The Slums Act is passed. The Feetham Commission is set up. The Asiatic Land Tenure and Trading Act is passed. This Act states that Indians may only live where they had lived prior to 30 May 1939, and that they may continue to live where ‘coloured’ people occupied land before 30 May 1939. 'Coloured' people start rent boycotts against ‘slumlords’ in Pageview. They voluntarily moved to the Coronation Township and Albertsville. The population of Pageview is largely Indian and the area starts developing an Indian character. Mosques, temples and churches are established and the 14th Street shopping Mecca becomes popular. The name Fietas refers to this period in history. Recommendations of the Feetham Commission are accepted. 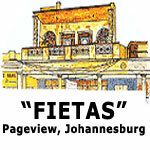 23 February, The area is officially named Pageview in honour of the then Mayor of Johannesburg, Mr. J.J. Page. Up to this point the area had become known as Fietas. August, The Johannesburg City Council buys land in the Diepkloof area with the intention of developing an ‘Indian’ area. 24 August, Indian representatives declared that the area near Diepkloof is acceptable to the Indian community in a meeting with the Minister of the Interior. They also pledge the full support of Indians for the scheme. 17 October, The Johannesburg City Council meets and approves a detailed report regarding the ‘Western Areas Scheme’. This scheme involved the conversion of Newclare, Western Native Township and the southern part of Claremont to ‘Coloured’ townships, and the removal of residents to Orlando, and the rezoning of Martindale and Sophiatown. 24 October, The above-mentioned resolution is conveyed to the Johannesburg City Council in the form of a letter. 20 November, The Transvaal Indian Congress passes a resolution objecting to the statement made on 17 October. 15 March, The Asiatic Land Tenure and Trading Act is amended and now states that Indians may only live where Indians had resided in non-proclaimed areas. The Transvaal Indian Congress undergoes a serious change as a result of the ‘nationalist’ takeover of the group by Dr. Yusuf Dadoo. This resulted in the ‘accomodationist’ old-guard leadership being replaced by a more radical group who felt that the Transvaal Indian Congress should be less accommodating towards the government and should take a stance of resistance. 13 July, A memorandum relating to the housing conditions and need for housing schemes of poorer Indians is presented to the Minister of the Interior by the Tamil Benefit Society. Most primary and secondary education of inhabitants of Fietas took place outside the area. Most people went to schools in Fordsburg. During this period cricket played a significant role in Fietas. Religion also featured highly. The biggest religion in Fietas was Islam, but Indian and Malay people had separate mosques. The impact of the Transvaal Indian Congress (TIC) or the ‘nationalists’, the Transvaal Indian Organisation (TIO) or ‘accomodationists’ and the Transvaal Indian Youth Organisation (TIYO) made itself felt within the internal politics of Fietas. The National Party wins the ‘white’ elections. The ‘non-white’ population of Fietas in concentrated between 11th Street in the north, 24th Street in the south, Krause Street in the east and Delarey Street in the west. More than 60% of the Pageview population is Indian. Thus about 40% was non-Indian. The ‘Xuma-Naicker-Dadoo’ Pact (the Three Doctors Pact) is made. Indian stand owners start renovating the cottages on their stands and charging people higher prices. All ‘Africans' living in Pageview are there illegally in terms of the Native Urban Areas Act of 1927 and are removed to Orlando. The Group Areas Act is passed. Transvaal Indian Congress initiates and implements the ‘Decade of Defiance'. The Lenasia Industrial Township Company applies to have a small tract of land proclaimed as an Indian Township in terms of the Group Areas Act of 1950. Faried Adams, a resident of Fietas and a member of the TICYO is the no. 1 accused in the Treason Trial. The area south of 22nd Street in Pageview is declared a ‘white' area, with effect a year after the proclamation. The farm of Rietfontein, near Lenasia, is expropriated by the Group Areas Development Board and is declared an Indian group area. The Group Areas Act of 1950 is re-enacted in consolidated form. All ‘non-whites' living south of 22nd Street n Pageview are given eviction notices. The ‘Africans' were moved to Soweto, the ‘Coloureds' to the Western Areas and Indians to Lenasia. Dr. Yusuf Dadoo is exiled. The Group Areas Development Board begins to provide public housing in Lenasia. August, The Group Areas Development Board is replaced by the Department of Community Development. Until this year there were 177 shops in the area with two mosques, four churches, two cinemas, 4 Islamic schools, 1 Hindu school, 1 Tamil school/temple/hall, 1 Indian girls' school, 1 ‘coloured' junior school, 1 ‘coloured' college, 1 Indian junior school, a communal hall and a number of social clubs. The Queenspark Sports Grounds next to the cemetery on Krause Street was considered part of Fietas. The residential stands in the area had an average of 4 cottages on it. Harry, ‘the fat man', a tramp living in Fietas disappeared. On inquiries to his family in Soweto it was found that he had died, but later it turned out that he was alive and well. 6 July, Mr. Mahomed Suliman Bhana, who had been active in the TIYC and is outspoken against apartheid policies, is served a banning order restricting him from attending any political or social gatherings, from entering any location and from leaving the Magisterial District of Johannesburg. All Pageview residents are issued with eviction orders. 24 July, Mr. Mahomed Suliman Bhana is released and given a remission of ten days for good behaviour. Lenasia is incorporated into the Johannesburg Municipal Area. The Oriental Plaza is established, but stands virtually empty until 1976 when unwilling traders are forcibly removed from their shops in Pageview. Major removals in Pageview begin. The Department of Community Development lists 4988 housing units administered by itself in Lenasia. The security forces, accompanied by other departmental officials and dogs forcibly remove remaining traders from their shops in Pageview. By this year all the traders in the area had left and the Oriental Plaza was established in Fordsburg. Fietas had disappeared. The name Pageview is used more regularly and becomes the generally used term. The area during this period was known as the ‘Malay Location', ‘Fietas', ‘Pageview' and even ‘Vrededorp', although Vrededorp, a white area, was in fact situated opposite Pageview. The Pageview Residents Association (PRA) enters into negotiations with the Department of Community Development in an attempt to keep residence. July Allan, ‘the China Man', an owner of a sweet shop, is forced to leave Pageview. He moves to a northern suburb of Johannesburg with his sister, Ming, but finds the transition very painful, remarking on the difference in treatment he receives from his new customers, who ridicule him for being Chinese and take products from his shop without paying. The Save Pageview Association (SPA) is established, replacing the Pageview Residents Association (PRA), which in turn had replaced the Pageview Traders and Standholders Association after the eviction of traders from Pageview to the Oriental Plaza. Most people have moved to Lenasia, but 67 Indian families still remain in Pageview ‘illegally'. They are all members of the SPA. December, Officials of the Department of Community Development hand eviction notices to the remaining 67 families in Pageview. This means that they have to evacuate the premises or be forcibly removed. The families lodge an application before the Rand Supreme Court to restrain the Department of Community Development from evicting them from their homes. Pending the decision of the court the families are allowed to stay. White people receive leases to their first homes in primarily the southern part of Pageview. By the end of the year they start moving in. February, The Department of Community Development starts digging up roads and trenches around the remaining residents of Pageview's houses. This results in further court cases after which the trenches had to be moved. This period is referred to as the ‘siege of Pageview'. July, Two Pageview residents, a mother and her four-year-old daughter, are killed when a neighbouring wall that was being demolished collapses on them. The tragedy is blamed on the City Council and the Department of Community Development, who are blamed of negligence and a lack of precautions in their operations. 22 January, The Transvaal Indian Congress is re-launched in Johannesburg and Mr Molvi Saloojee, the last president of the TIC and resident of Fietas dies. 19 September, Dr. Yusuf Dadoo dies in exile. The last remaining trader in Pageview, Baba Saheb, leaves Pageview and his family's butcher shop to move to Lenasia. He was locked out of his shop following an eviction order, which he had ignored. The matter had been taken to court and the Department of Community Development was ordered to open the shop, but left with few options Mr. Saheb and his family moved. 867 people are ‘reclassified'. The classification of non-white South Africans adhered to the following criteria: ‘Coolie’ – people of Indian, Asian and Middle Eastern descent, ‘Kaffir' – African people, ‘Coloured' – racially mixed South Africans. The SPA and other extra-parliamentary groups condemn the Group Areas Amendment Bill. The Bill does not become law.